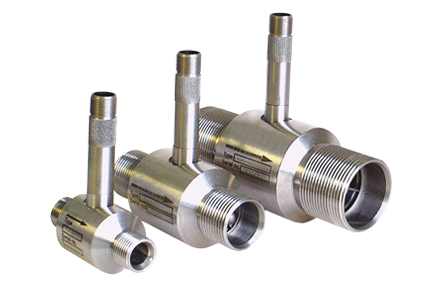 The ABLE range of turbine flow meters offer high accuracy and reliability. A ferritic, stainless steel rotor revolves within a non magnetic housing on the outside of which is located a pick off coil containing a permanent magnet. As the rotor blades pass the tip of the permanent magnet, the reluctance of the magnetic circuit is changed and a small ac voltage is generated in the coil. The frequency of the ac voltage is proportional to flow rate, and the total number of pulses produced represents total flow passed through the meter. The electrical signal is a sinusoidal pulse of minimum height 50mV peak at lowest flow rate, rising to 800mV peak at max flow rate. For normal transmission distance pre-amplifiers are not essential since pulse shaping and conditioning are carried out in the appropriate electronic readout unit. Remote flow rate indication, alarms, totalising and batch control functions are available utilising our wide range of secondary electronic instruments, the subject of separate brochures. The flow meter may be located some considerable distance from the associated secondary instrument.